FastStep players picked up an impressive 4 championship titles at the U15/U17 Sussex Junior Badminton Championships in Portslade today. Luke Davies (left) was unseeded in the boys U15 singles, but played brilliantly all day to win the title. Then Luke paired up with fellow FastStep player Harry Tree (right) to win the U15 boys doubles in a very close round robin event. Harry also won the U15 boys singles plate. Eva Craig (left) retained her U15 girls singles title, with some hard fought games, then won the U15 girls doubles with partner Emma Ford (right). The girls also competed in the U17 girls doubles and won their box and the semi final before losing in the final. 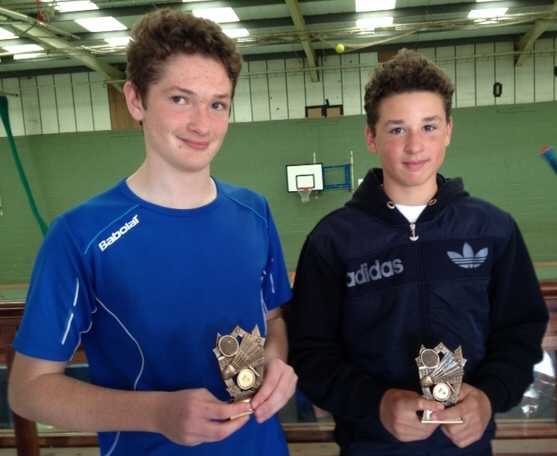 Ben Smith (right) and David Jolliffe (left) were third in the U15 boys doubles, just 2 points away from the title! While Casey Coats picked up the U17 girls singles plate. Well done to all our players today who played so hard and should be very proud of their efforts.